The town of Stockbridge, made famous by Norman Rockwell’s painting of the village during the holidays, becomes a magical New England setting decorated with holiday wreaths and festive lights, as the town celebrates Stockbridge Main Street at Christmas December 6, 7 & 8, 2019. Sponsored by the Stockbridge Chamber of Commerce, the holiday celebration offers a full range of activities, with highlights on Saturday including Holiday House Tours, Caroling and a Holiday Concert. 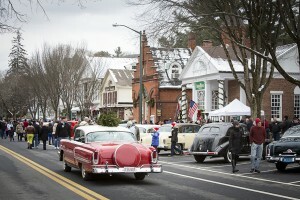 Capping off the weekend is a recreation on Sunday of the scene depicted in Stockbridge Main Street at Christmas, complete with vintage automobiles parked in the spots occupied in the painting. The day’s activities include horse drawn rides, a visit from Santa, Roger the Jester, lunch at the Christmas Food Booth and much more. The festivities celebrate Rockwell’s popular depiction of what for many is the quintessential small New England Town, with all the longing for a simpler time that it represents. Rockwell began painting the popular image in 1956, but did not complete it until December 1967. The image and character of Stockbridge has changed little over the years, thanks to the great care and affection of its residents, and it is that special ambience which draws so many. We are once again inviting antique car owners to participate in this great event by show casing their collectibles on Sunday, December 8th from 12 to 2pm . It’s been a wonderful experience planning the event each year as we look forward to seeing our old friends and making new ones. We appreciate your continued support and hope that you will be able to celebrate with us. With each year that passes, the event details need updating and changing. Please review the key points below before pre-registering. NOTABLE CHANGES for this year’s event apply to Departure times. Please review all Key Points. Pre-registration is required and must be submitted by November 15th. Spaces are limited to 55. Please do not come as an antique car participant if you have not preregistered and received confirmation notice from the Chamber office. If you still wish to enjoy to the event as a patron, we welcome you. Parking is available East and West of the Main Street block. The days’ activities require an admittance button which will be on sale on the day of the event. Buttons are $5.00 per person. 12Noon to 2PM This is a closed pedestrian walkway event. The event ends at 2pm but you need to wait for the road to open. It may take 5 to 10 minutes after 2 to open, so please allow time for the officers to open the road before departing. Thank YOU! 10:30-11:30 AM No early bird arrivals please. We understand that you want a prime parking spot but since the street is not closed to traffic before 11:30AM, we need police coverage to assist you with parking. If you arrive while the road is blocked, please enter onto Main Street from the Red Lion Inn side. Parking will be “first come, first serve” to the pre-registered participants. Please do not park on Main Street before 10:30AM. Cars that best duplicate the Main Street picture should park on The Red Lion Inn side of the street with other models directly across the street. The objective of the days’ event is to recreate the Rockwell painting. Visitors enjoy taking photos of the replication. Please do not park on the Red Lion Inn side of the street if your vehicle does not duplicate the image or has large signs or advertisements on the vehicle. Registration will open at 10:30AM and close promptly at 12 noon. Upon arrival, park your car on the appropriate side of street and check-in with Mike Diaz who will be in the Wheeler & Taylor Office Building. The first 55 participants will receive 1 dash plaque and 1 admittance button. If you bring guests to partake in the activities, they will need to purchase admittance buttons which will be on sale at the registration desk. They are $5.00 each. We will not mail dash plaques or buttons if you preregistered and did not show, so you must be present. Due to space limitation, participants with trailers will need to make arrangements with the Chamber office first. We prefer that you email (info@stockbridgechamber.org) us OR call (413-298-5200) with the following details by November 15th. You will receive a confirmation email from the Chamber office. From Boston- Mass.Turnpike (Rte. 90) West to Exit 2, Rte. 102 West to Stockbridge. From New York City- Taconic State Parkway North to Rte. 23 East to Great Barrington, Rte. 7 North to Stockbridge. From Albany- New York State Thruway East (Rte. 90) to Exit B3, Rte. 22 South to Rte. 102 East to Stockbridge.